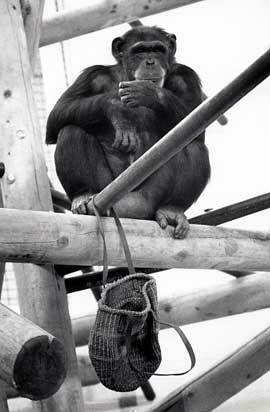 Washoe was born in Africa, around September of 1965. 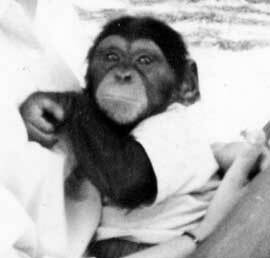 She was the only one of the four chimpanzees at CHCI to have been born in Africa. Her capture probably consisted of a hunter killing her mother and then taking her to market to be sold to a dealer. After she was brought to the United States for the Air Force, Drs. Allen and Beatrix Gardner adopted her for their research. Washoe was the matriarch of this family and was the first chimpanzee to acquire a human language. Her name sign is formed with the fingers of a "W" hand flicking the ear on the same side. She was named for Washoe county Nevada where she lived with Drs. Allen and Beatrix Gardner until age five. Full Name: Washoe Pan satyrus. 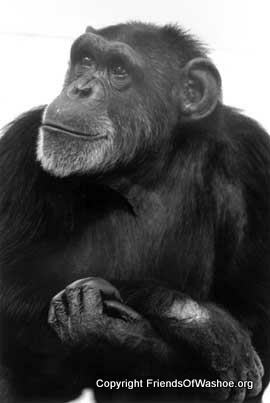 Pan satyrus is an old taxonomic classification used for chimpanzees. She was named for Washoe county Nevada where she spent her early childhood with the Gardners. Washoe is a Native American word from the Washoe tribe meaning "people." Name Sign: “W” flicked on ear. Refers to the large ears she had as an infant that she has since grown into. Date of Birth: Unknown; estimated to be September, 1965. Washoe’s birthday is celebrated on June 21, 1966, the anniversary of "Project Washoe." Place of Birth: Washoe was born in West Africa, wild captured, and later used by the US Air Force. Date of Death: Washoe passed way October 30, 2007 at CHCI after a brief illness. She was surrounded by her family and closest friends. Early Childhood/Rearing Conditions: Washoe was adopted by Drs. Beatrix T. and R. Allen Gardner on June 21, 1966. She was cross-fostered; that is, she was raised in the Gardners' home as if she were a deaf human child. 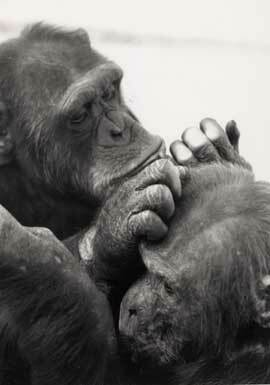 Washoe was the first non-human to acquire a human language -- American Sign Language. She moved with Roger and Deborah Fouts to the University of Oklahoma in 1970 and came with them to Central Washington University in 1980. 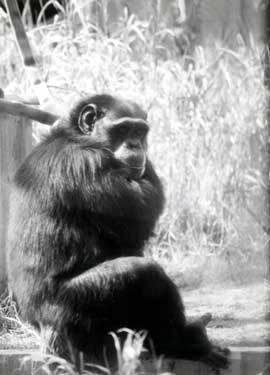 Personal: Washoe was the matriarch of the CHCI family of chimpanzees and was maternal toward the other chimpanzees. 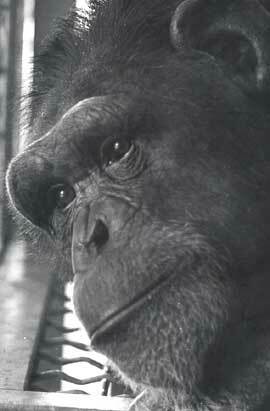 She will be remembered for being fair and kind with both chimpanzee and human companions. Washoe was slow to invest herself, but with time, she became a loyal friend to many. She had a good sense of humor. Favorite Activities: Washoe enjoyed spending time in outdoors. She spent her free time looking through books, magazines, and catalogs (especially shoe catalogs). She liked to look at them by herself but didn’t mind signing about the pictures with friends. Other activities she engaged in were brushing her teeth, painting, coffee and tea parties, and checking out the shoes of her human companions. Favorite Foods: Oatmeal with onions, pumpkin pudding, split pea soup, eggplant, gum, tea and coffee.